On the face of it, the Camber 29 is a scaled up version of the 26in Camber Expert, sharing much of the same technology: tapered head tube, 142 x 12mm bolt-through rear dropouts, direct mount front mech and PressFit 30 BB. 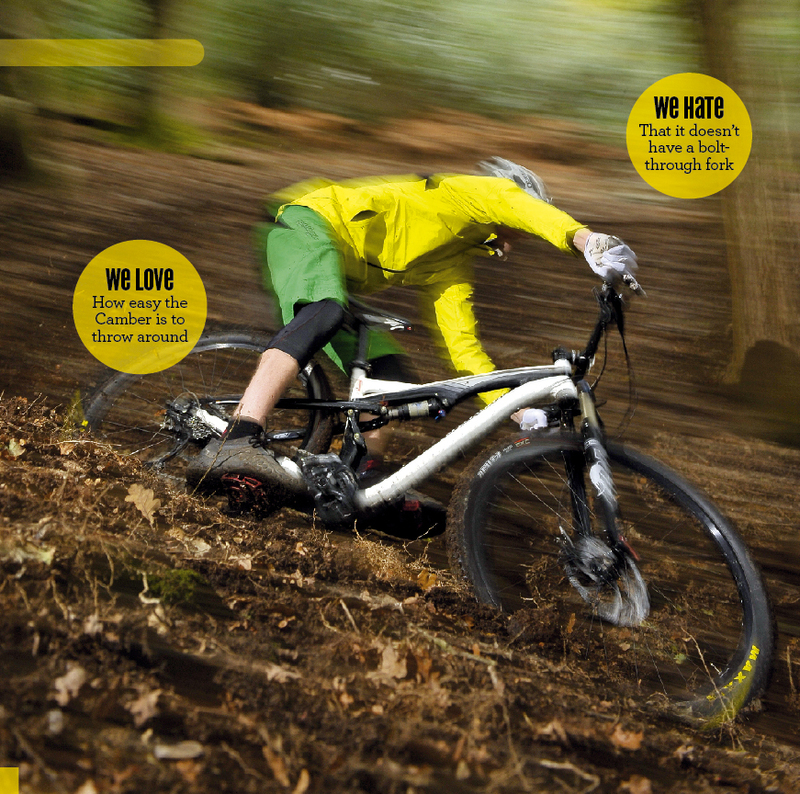 The bikes aren’t identical, though, as the 29er version has 110mm of travel, 10mm less than the Camber 26. The geometry is also very different. Most notable is the increased chainstay length, necessary to accommodate the bigger rear wheel. 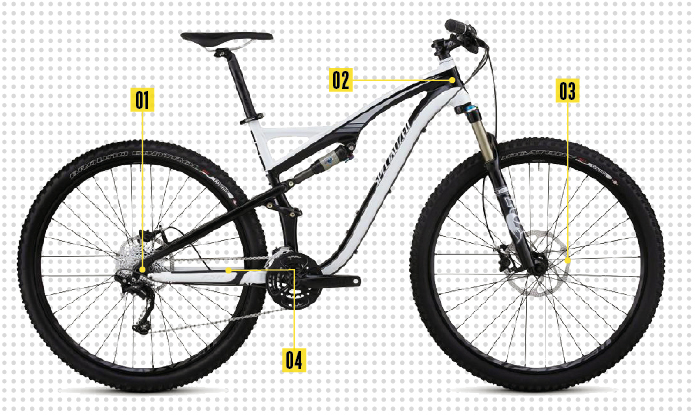 While the Camber 29 has less travel, it shares an almost identical FSR suspension layout with its 26in cousin. The custom Fox Triad II rear shock offers three compression settings: open, ProPedal and locked. Give the choice we’d happily trade the lock-out setting for one that sits between the fully open and ProPedal. Still, the overall feel of the rear suspension is in harmony with the 110mm-travel open bath Fox Evolution Float RL fork. It’s just a shame that the fork doesn’t have 15mm bolt-through dropouts, given the Camber’s DH potential. To help bridge the gap in steering stiffness between regular QR fork dropouts and 15mm bolt-through, Specialized uses 24mm oversized hub end caps and a straight through 9mm QR. On the rear, Specialized’s 142+ hub standard is designed to improve wheel stiffness and strength. Given that the wheels on the Camber faired better than those on the Rumblefish — even though they are almost half a pound lighter — that plus sign must be doing something. We really like the 2×10 set-up on the Camber — shifting is precise, the burly crank assembly feels reassuringly stiff and the 36/24t gearing offers more than enough choice. After several wet, muddy rides, the PressFit 30 BB started sounding dry and in need of lube, so we suggest keeping a close eye on it. With a 720mm bar and 75mm stem, the cockpit layout on the Camber 29 is way better than most 26in bikes we test. Our only complaint is that the lousy QR seat collar packed in after one muddy ride. Experienced 26in riders slinging a leg over the Camber for the first time instantly pick up on, and voice concerns about, the relatively steep head angle. Once out of the car park, however, it never gets mentioned again. Instead, when the tempo slows, the chat changes to how much fun the Camber is to shred and the copious amount of cornering traction it provides. Also how quiet it is, and how the chain doesn’t seem to drop as often as on a 26in bike. At some point someone always asks if we are sure that it only has 110mm of travel. We actually had to double-check this ourselves after the first outing. But how does it compare with the Trek? For starters the rear suspension is more supple, possibly a touch too soft for the most aggressive riding. In fact, we found it relatively easy to bottom the rear suspension on jumps. With lighter wheels, the Camber is noticeably faster out of the blocks, but overall the bike doesn’t feel as solid as the Trek. The quick-release fork lowers and suspension action both play a part here. Ultimately what swung it for us is that the Camber is more playful in character, and edges ahead of the Trek in the fun stakes. In that respect, it’s more akin to a 26in-wheel trail bike. With the Camber Comp 29, Specialized has done an amazing job of marrying the benefits of big wheels and the fun-loving manoeuvrability of the original Camber 26. Not only is it every bit as easy to ride, it’s comparatively light and we think it looks just as cool. Granted, it’s not as solid as the Rumblefish, but it’s no wet noodle, either. Out of the box, the cockpit layout is more sorted than the Trek and while the slightly steeper head angle gives initial mixed messages, the ride is anything but confused. 1: Specialized’s 142+ rear hub uses the same dropouts, hub width and axle spacing as regular 142mm wheels, where the plus simply denotes wider hub flange spacing for improved wheel stiffness. 2: A tapered head tube and fork steerer improve strength and stiffness, but we’d like to see the package rounded out with QR15 dropouts. 3: Size-specific disc brake rotors see the small and medium Camber 29 sporting 180/160mm rotors, with the three larger sizes getting 200/180mm. 4: Part of the reason for the Camber’s near-silent ride is the dedicated chainstay protector. Drivetrain: Sram S1250 BB30 chainset 2×10, SLX shifters, XT rear mech, X7 front.